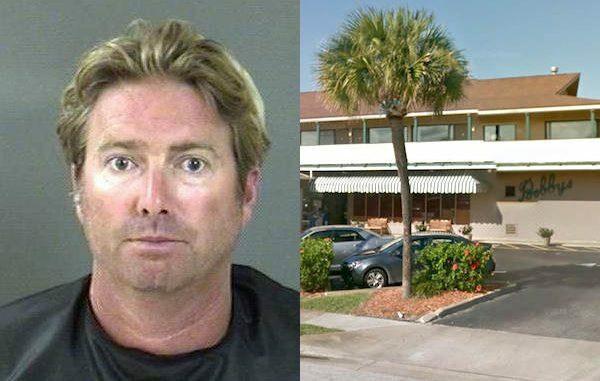 Vero Beach man arrested after punching bar windows at Bobby's Restaurant. VERO BEACH – The staff at Bobby’s Restaurant in Vero Beach called police about a patron punching the outside windows of the establishment. Vero Beach Police officers arrived and were told that the man, later identified as 42-year-old Kenneth Hite, was asked to leave the bar after creating a disturbance. Hite was angry that the bartender refused to serve him any more alcohol because of the way he was behaving. He had allegedly approached other patrons and smelled their child’s blanket. A security officer asked Hite to leave and escorted him outside. Once outside, Hite began to argue with security and began punching the windows of the bar. Officers made contact with Hite, who was allegedly intoxicated. “He advised me that he did not do anything wrong. While contacting Mr. Hite, I noticed the smell of an alcoholic beverage emitting from his person. Mr. Hite was also slurring his words and continued to repeat himself,” the officer said. The officer issued a trespass warning to Hite and explained to him that he could not return to the property. Before leaving, the officer made sure Hite walked away from the property. A few minutes later, the officer returned and found Hite back at the Vero Beach business creating another disturbance. Hite was arrested and transported to the Indian River County Jail where he was charged with trespassing.